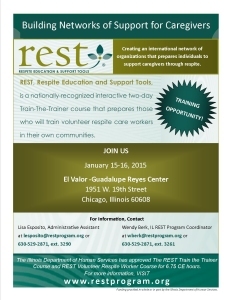 REST (Respite Education & Support Tools) held its first bilingual training last month at El Valor, a social service agency that reaches about 4,000 families in Chicago, most of which are Hispanic. REST training will especially benefit El Valor’s respite program and home-based services for people with developmental disabilities, said Yesenia Ariza, home based service facilitator. At its children and family centers in the Little Village, Pilsen and South Chicago neighborhoods, El Valor works with more than 4,000 children under the age of five, 20 percent of whom are diagnosed with a developmental or physical disability. In addition, El Valor works with more than 1,000 individuals with disabilities and their families, with such services as employment placement programs, residential community housing and developmental training. Services also include respite, with 275 families relying on the program, and 200 more are on the waiting list. The U.S. Census Bureau reports that people of Hispanic origin constitute the nation’s largest ethnic or racial minority – or 17 percent of the nation’s total population. As of July 1, 2013, the Hispanic population in the United States was 54 million. By 2060, experts predict that population to grow to 128.8 million. REST staff members look forward to continuing to meet the needs of Hispanic communities throughout the United States. For more information on how your organization can host a bilingual training, please contact Wendy Berk, program coordinator, at 630-397-5659 or wberk@restprogram.org or visit www.restprogram.org.